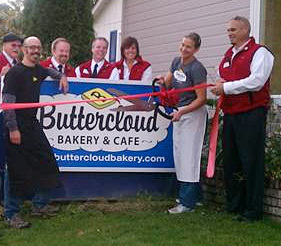 Buttercloud Bakery and Cafe: Thanks Medford! Our Grand Opening was a huge success! Thanks to everyone who made it out to say hello and special thanks to the Medford Chamber ambassadors for coming out to host the Ribbon Cutting. Ellen and I are honored to be part of such a tight knit community and look forward to serving up great eats to all of you in the years to come. After another busy day today, I finally got around to choosing the random business card winners for our Grand Opening raffle. The winner of a stylish Buttercloud T-Shirt is Katy Alstat and the winner of a shiny new Buttercloud mug is Rosie Brammer. Congrats!